For a very long time, I stopped attending media and blogger events, an eventuality of working when the rest of the world is sleeping. From morning till afternoon, where most events are held, I’m home sleeping. But last Wednesday, I went to Chino Roces, Makati to attend Air Asia Philippines’ Create Camp event. Save for the title of the event, I knew nothing about it. I came there not expecting anything but went home feeling inspired and grateful. Air Asia is a low-cost airline based in Malaysia. Air Asia Philippines started its operations in 2012, traveling on 30 routes within the country and the rest of Asia. I’ve flown with this airline more than I could count because of its competitive air fares. They recently opened a competition for young storytellers called Create Camp, a social media reality search. The event revealed the 5 finalists who would go head to head for a chance to win over 1 million pesos worth of prizes, trips, and mentorship programs. The selected finalists will undergo a training on photography, videography, and travel under the tutelage of the present Air Asia storytellers. The 9 people who will serve as mentors to the finalists are Benj Ramos (entrepreneur/photographer), Enzo Cruz (photographer), Ayen Dela Torre (educator and founder of Where to Next), Rachel Halili (graphic designer and co-founder of Where to Next), Nella Lomotan (marketing professional/photographer), Javi Cang (investment banker/mountaineer), Patrick Martin (social entrepreneur/adventure filmmaker), Kyrke Jaleco (travel and corporate filmmaker), and Pao Cuarteron (photographer). And who are the lucky 5? 1. Cara Durano – a fresh graduate from De La Salle University who has the passion for adventure and music. 2. Ray Ambler Baguilar – a business student from the University of Baguio who is also a part-time financial advisor. 3. Jaip Saluba – a travel filmmaker from Iloilo. 5. Bea Pargas – a student and a teacher from UP Diliman. We were shown the videos that the 5 contestants created during the announcement of the finalists. I am no filmmaker, but I stake a claim in being a storyteller; I know a good story when I see one. Based on the videos presented, I could see why these five people were selected. Each finalist has a unique style and clever cinematic techniques required to make a compelling film. I was very impressed, particularly with the video entries of the 3 male finalists. Out of the 5, my favorite video was created by Saluba; the transitions are seamless, the backlighting is impeccable, the voice over perfectly melds with the sound effects. The cross-cutting, aerial shots and jump cuts were cleverly integrated, creating such an enticing narrative. You may see this video on this link. I could not help but be inspired by these 5 souls, almost envious that they already knew what they want to do this early in life. Their videos, a vivid reminder of how much a person can achieve if he or she follows his/her passion. But that’s not the only exciting thing that happened in this event. Air Asia gave away round-trip tickets on some Philippine and Asian destinations. I was reading something on my phone when I heard my name; I won a return ticket to Iloilo! Thank you, Air Asia, for this wonderful opportunity! 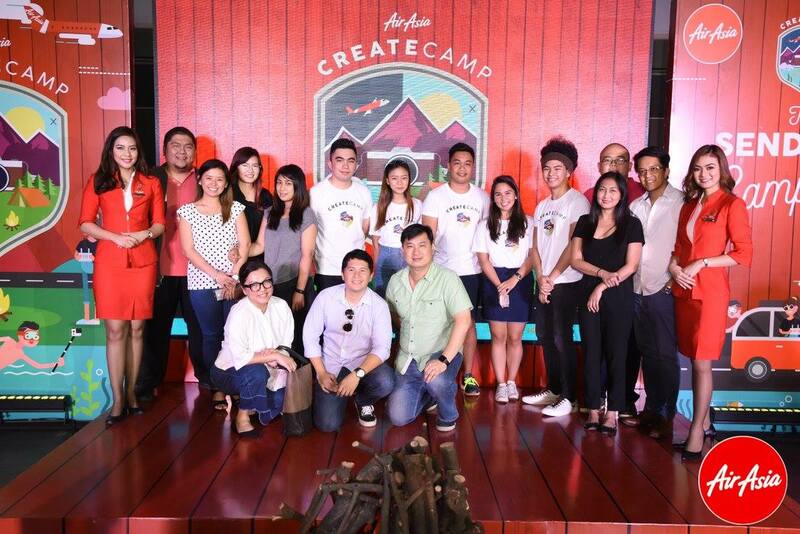 Congratulations and good luck to the 5 finalists of Air Asia’s Create Camp! The top 5 seem like great and amazing talents. I wish I could be as their level. haha I like Air asia because even though it’s always not punctual, still gives the lowest price and gives each individual the chance to travel. And congrats to you too, Marge! Come and visit me here in Bangkok! Congratulations to all the finalists. Have travelled air asia and my experience has been good. ..wish you a lot more success in the future as well. What a great initiative by Air Asia! For many bloggers, making videos is something that is not easy to do and many try to include these with their work simply because of the demand or interest of readers. It’s certainly a very useful (and fun) skill to learn and the winners of this contest will surely benefit greatly. Congratulations to you also for winning your flight! Hey those videos look great! I think it’s a great initiative by Air Asia Philippines to create a buzz like this. I saw the video by Saluba, it was amazing and so professionally done! I just hope Air Asia does a similar campaign in India as well! What a great program this is! It is wonderful to see such enthusiasm and talent. Congrats Marjorie for the return ticket and congrats to all those talented film makers. I have tried my hand at videos but impatience got the better of me. You definitely deserve this award because you are not just a consistent story-teller but a great one too. I have never traveled Air Asia , though one of my friends is a pilot with this airline. By the way, I have helped you earn some money too ( clicked an ad).